Demographics, migration, trade, digitalisation and the future of the EU were all high on the agenda at our annual event. wiiw held its Spring Seminar on April 4th, gathering together our members, journalists, policymakers and think tankers in Vienna for our main annual event. Around 200 people were in attendance, to hear two keynote speakers, several presentations by wiiw staff, and a panel discussion involving representatives from our sister organisations around the Central, East and Southeast Europe (CESEE) region. Welcome addresses were given by Ewald Nowotny, the Governor of the Austrian Central Bank and ECB board member, and Hannes Swoboda, wiiw President. The first keynote was given by Robert Koopman, Chief Economist and Director of the Economic Research and Statistics Division at the World Trade Organization (WTO). He spoke about the dramatic changes that have taken place in world trade over the last 35 years, and how these have been influenced not only by policy, but also underlying macroeconomic forces. In addition, Mr Koopman addressed current trade conflicts, particularly that between the US and China, and sketched out the potential costs for economic growth that this could have. The second keynote was given by Rosa Balfour, senior transatlantic fellow at The German Marshall Fund of the United States. She spoke about Brexit, and its lessons for the rest of the EU. Ms Balfour stressed that, while there are some idiosyncrasies related to the UK, it would be a mistake for other governments in the EU to think that many of the underlying drivers of Brexit do not also apply in their countries. She noted, among other factors, the collapse of major centrist parties in some parts of the EU, and the general fraying of bonds between many of these centrist parties and voters. Richard Grieveson presented the new outlook for CESEE, stressing that the peak of the cycle has passed, and that growth will be slower in the next three years that was the case in 2017-18. 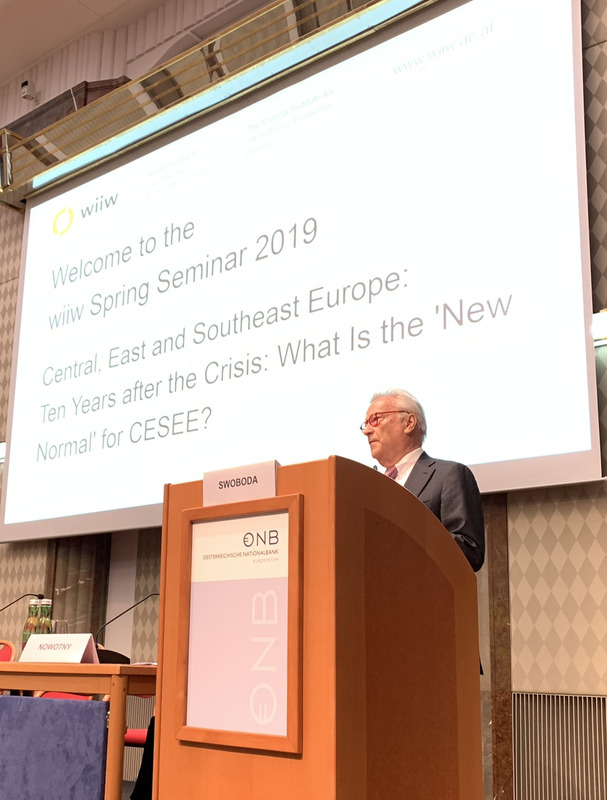 He also looked beyond the forecast period, and highlighted demographics, automation, digitalisation and the rise of authoritarianism (and its implications for institutions) as the key challenges for CESEE in the “new normal”. Isilda Mara discussed migration trends within Europe, and argued that the flow of people from EU-CEE to Western Europe seen over the past 15 years is running out of steam. Labour shortages in EU-CEE are driving up wages, reducing the gap with Western Europe. By contrast, outward migration of the Western Balkans is likely to remain strong, owing to a still-large wage gap, among other factors. This creates big risks for the region in terms of the demographic structure and human capital, as younger, well-educated people are particularly highly represented among emigrants. Sandra Leitner presented the results of a recent wiiw study seeking to identify the “tipping point” when labour demand will outstrip labour supply in the EU. She showed that for the EU as a whole, this “tipping point” will likely come before 2030. Even more problematically, for a large number of EU-CEE countries, the “tipping point” is imminent, and will likely arrive before 2025. A number of potential policy options were presented which could at least mitigate these trends, including higher immigration, automation, digitalisation and fertility rates. The panellists discussed the challenges for their countries in the “new normal”, and policy options for governments to meet them. The event was chaired by wiiw Scientific Director Robert Stehrer, Senior Research Associate and former Scientific Director (1996-2016) Michael Landesmann, and wiiw Director Mario Holzner. Copies of the presentations and videos of the event will soon be uploaded below.